The Jurassic World Legacy Collection roars into action celebrating classic moments, themes and characters from the blockbuster film franchise! Play out all the exciting action with this set featuring an iconic character and dinosaurs from the first Jurassic Park film. 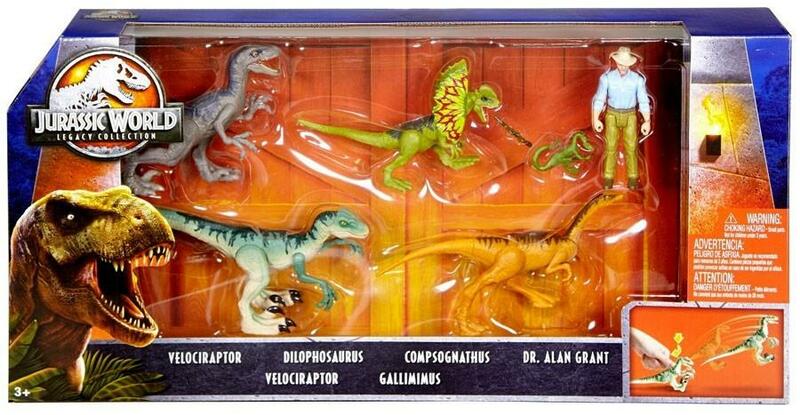 This 6pk includes the Alan Grant figure in 3 " action scale with 10 points of articulation, a uniquely posed attaching Compy dinosaur and an accessory unique to Grant's character. More movie adventure fun includes a leaping Velociraptor (pull back activation on the legs makes it leap forward when released) and three dynamically posed Attack Pack dinosaurs: Velociraptor, Gallimimus and Dilophosaurus. Each Attack Pack dinosaur includes five points of articulation, realistic sculpting and authentic decoration. Get ready for classic movie moments to come to life and play out all the exiting action with this 6pk ! Since this site hasnt had pricing updates in a very long time, I'm providing a link to current "sold" auctions on Ebay. You may have to copy and paste.